We can expect new President Obama to lift the absurd ban on Cuba, or at least make the attempt through Congress. He will surely allow Americans to fly to that abused island and bring some relief from the oppressive communist regime. The island”celebrated” 50 years of Fidel’s take over without fanfare from the majority of the populace. Their political and economic conditions have remained fixed in time during that half century as if a gigantic time machine had remained stuck in 1959. While nobody in Cuba dies of hunger and almost everybody can read and write (their literacy rate is among the highest in the world), an individual can easily ask”what for?” There is not any freedom of any kind except to laud the virtues of this fantastic leader, or, as it’s called in another dictatorship, our Beloved Great Leader (North Korea). Cuba and North Korea are two examples of massive brainwashing, although much more so in China’s neighbor. Cuba has the”luck” of having the United States next door, and the superpower’s influence, notwithstanding the blockade, has been the difference among the populace. Cubans still retain some contact with the mainland, whether clandestinely or through American family members. While working in Mexico, I had the opportunity to talk to Cubans residing in that country; some had to come back to the island, while some had migrated permanently. A surgeon told me that her monthly salary was the equivalent of $30, but she added that everyone received free education (considered one of the best the world), and that the food was heavily subsidized, as was rent (no private property permitted ), and healthcare. I could perceive an undertone of deep dissatisfaction in their comments regarding the total lack of freedoms and choices. The surgeon talked about the first time she entered a grocery store in Monterrey, Mexico; her eyes widened with shock. She had never seen so many products and so many choices on the shelves. Very few Cubans have their own landline phone (9 percent ) and even less have a cell phone (1%). Although many have televisions (70 percent ), who wants to listen to Fidel’s endless tirades (he loved to listen to himself when he was still in control) of up to 3 hours? Who wants to see the official government’s propaganda machine? Just a few revolutionary diehards still support the communist regime and the”exalted” memory of the Che Guevara, a psychotic physician who shot anyone who disagreed with him. China, the giant communist regime, had the wisdom to transform its totalitarian dogmas to permit some token of capitalistic industry. Cuba is only starting to know, under Fidel’s brother’s control, that people have an innate drive to have something. Raul Castro has even invited the Cuban people to voice their criticism of the government, a step that received very little response as individuals doubt seriously that the regime could really act upon the recommendations. 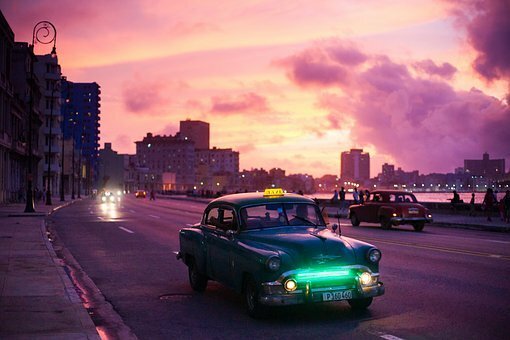 The lack of opportunities in Cuba is very hard on youth. The island has among the highest suicide rates in the world. Again, what’s the point of getting free education all the way to school if the government tells you what to research and if there are no outlets for your skills? The word apathetic is the adjective most commonly heard when talking of young Cubans. Regardless of occasional desertions among athletic teams who travel to other countries, most young Cubans do not need to abandon their island. What they want is more freedom to come and go as they please and to have the opportunity to voice their concerns. President Obama has already expressed his desire to initiate discussions with the Cuban authorities. He must ignore the extreme faction of Cuban-Americans from Miami who want no contact with the Caribbean island. The ridiculous blockade ought to be eliminated for two important reasons: Cubans already get American goods through third parties (European countries), and an open trade with Cuba are the best way to topple that odious dictatorship.